Kecia Rust is the Executive Director and founder of the Centre for Affordable Housing Finance in Africa (CAHF). In this issue of the Global Housing Watch newsletter, Rust talks about how CAHF is tracking the housing market in Africa, the “Big Mac Index” for housing, why housing finance remains elusive, why housing matters to all stakeholders, and more. 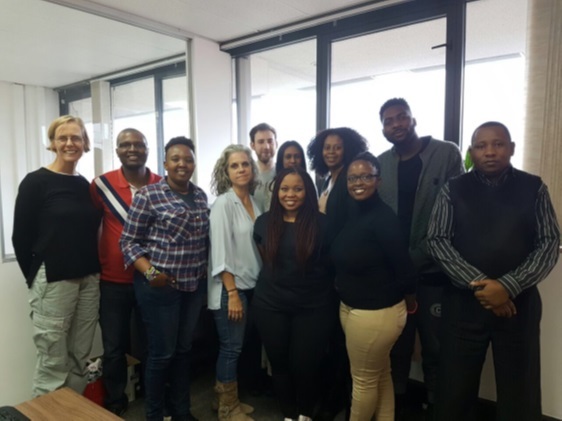 From left to right: Kecia Rust, Kudakwashe Mativenga, Miriam Maina, Adelaide Steedley, Samuel Suttner, Sireena Ramparsad, Kgomotso Tolamo, Aqua Suliali, Noluthando Ntshanga, Joseph Tembe, and Alfred Namponya. 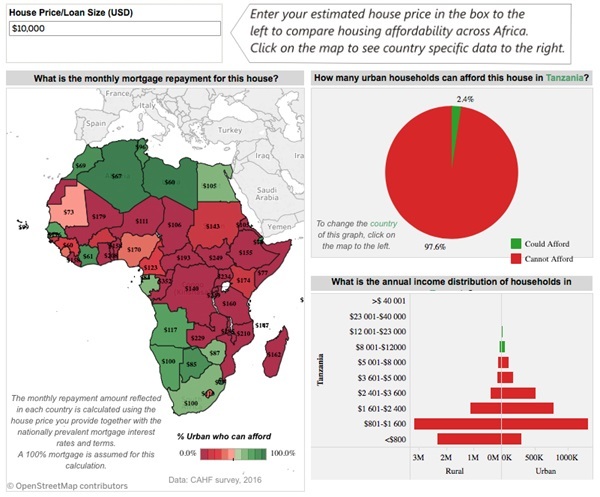 Hites Ahir: How do you track the housing market in African countries? Kecia Rust: Historically, not many people have looked at housing market activity in African countries. Policy makers have seen housing as a social good that satisfied a right to shelter, while the private sector had very little involvement in housing markets as the majority of even high income households built their homes themselves. Trading activity simply was not monitored. With the development of land titling systems and mortgage markets in many countries, and increased investment attention on residential property, however, this is changing, and there are a number of agencies that highlight residential property dynamics in their respective countries. The focus of most of these efforts, however, is on higher value, and luxury property markets. While this is certainly of interest to investors and participants in those markets, it overlooks the potential and dynamics of the much larger market of middle class and emerging middle class households who are also beginning to express a demand for housing. The key challenge in this market segment, of course, is affordability. For the past six years, CAHF has conducted an annual survey of local, in-country experts, to get an indication of the state of housing markets and housing affordability. We have asked them to define, from their professional perspectives, the price of the cheapest newly built house, built in the past year by a private developer. We also ask for the size of that house. The data does not indicate the cheapest house that can be built, but rather the cheapest house that is being built. This distinction is important: developers choose their markets based on a variety of factors including their sense of local affordability (a function not only of income but also the availability of end user finance), access to materials and construction finance, and their sense of local expectations. Hites Ahir: What do current house prices tell us? Kecia Rust: We can see a wide variation in the prices of the cheapest, developer-built houses. Of course, these are not equivalent structures. The US$200,000 house in Angola is about 100 square meters, whereas the US$10,000 Nigerian house is about 25 square meters. But size doesn’t necessarily correlate with price. In Uganda, a 120 square meter house is recorded as costing US$30,000, while in Cameroon, a 200 square meter house was delivered and sold for about US$20,000. Our method clearly wasn’t comparing apples with apples, and local variation is invisible. For this reason, we’ve tried a new methodology to track housing prices, by building something like a “Big Mac Index” for housing. Working with the Affordable Housing Institute, we designed a typical entry-level house: 46 square meters with a 9 square meter verandah, on a 120 square meter plot of land, in a 20-unit development. We prepared a Bill of Quantities down to brick level – with over 400 cost components – and sent this to Quantity Surveyors in 15 countries. We asked the Quantity Surveyors to prepare a quotation for this spec in the capital city, and another major city in the country. Then we checked the data, going back and forth with the Quantity Surveyors and thinking about local construction sector dynamics in the different countries. The data is about to be released, but we have some preliminary findings we can share. We found that the price of this standard house ranged from just under US$30,000 in Dar es Salaam, Tanzania, to just over US$60,000 in Nairobi, Kenya. Significant variation was found in construction costs – the highest being in Kolwezi, Democratic Republic of Congo; as well as in infrastructure costs, which are particularly elevated in Lilongwe, Malawi and Monrovia, Liberia. High land prices, likely a result of urbanization pressures, were evident in Nairobi, Dakar, and Kampala. 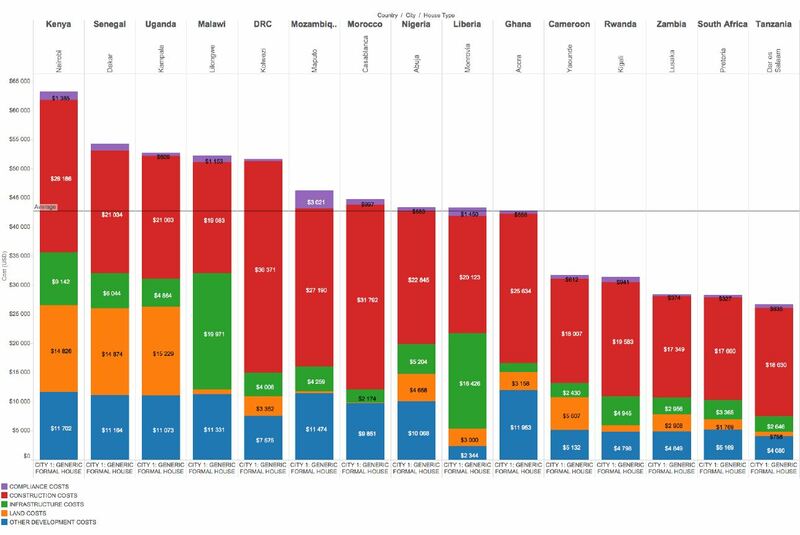 The bigger story that this data is telling us is currently being explored, and we’ll publish it shortly, but a very clear takeaway at this stage is that it is about much more than the price of bricks: in the construction costs category, the major difference for the countries where these costs are highest (Democratic Republic of Congo, Morocco), is labour – over a third of the total construction value. In Nigeria, while the overall house price is close to the average of just above US$40,000, more than half of the construction component is labour. In some countries, indirect costs are a significant component of the construction component (Mozambique and Cameroon). Another category where there is quite significant variation is “other development costs”. This includes Marketing, Finance & Holding Costs, and Sales Taxes. Sales taxes were found to be highest in Nairobi (US$8,723, on a US$64,000 house, or 13 percent of the total price), Kampala, Dakar, Lilongwe, Casablanca and Kolwezi. 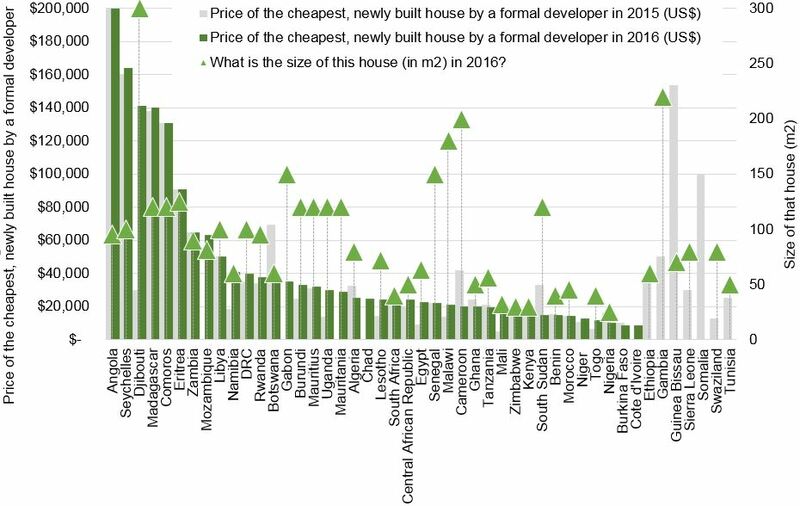 Finance and Holding Costs were highest in Maputo (US$6,346, in a US$46,000 house). Hites Ahir: Are these prices affordable? Kecia Rust: No. Not even to a large minority. We have an affordability calculator on our website that calculates the monthly mortgage repayment on a loan for a house. The user can input the house price, and based on the mortgage loan terms and income distribution in that particular country, if the loan were indeed available, the calculator reports the monthly repayment, and the proportion of the urban population that can afford that house. While a US$20,000 housing loan is affordable to about 55 percent of urban households in Namibia, 49 percent of urban households in Morocco, and 59 percent of households in Cote d’Ivoire, it is affordable to only 3.8 percent of urban households in Kenya, 3.1 percent of urban households in Zambia, 0.7 percent of urban households in Tanzania, and 0.5 percent in Mozambique. If we reduced the house to US$10,000, the proportion of households with affordability does increase – just over 10 percent in Kenya, 6.7 percent in Zambia, 2.4 percent in Tanzania, and 1.7 percent in Mozambique – but it is still very limited. There are two ways we might deal with this. On the one hand, housing affordability is a function not only of house price but also the terms of financing it. In Kenya, a mortgage loan is available for over ten years at 17.1 percent, while in Zambia the rate on a mortgage in 2016 was 27 percent over 15 years. In Tanzania, a mortgage can be accessed for a 25-year term, but the interest rate is still high at 19 percent. In Mozambique, a 20-year mortgage comes at a rate of 25 percent. If we flip the analysis around, we find that just on the basis of mortgage conditions in a country, a household in Tanzania that could afford to repay a house costing US$10,000, could afford a house in South Africa costing US$17,500, and in Cote d’Ivoire costing US$28,500. Hites Ahir: Why is housing finance underdeveloped? Kecia Rust: Housing finance markets in Africa are underdeveloped for a number of reasons. A key issue relates to the overall macroeconomic environment and the implications this has for access to and the cost of capital for lending. Lenders struggle to access capital to fund their housing loan portfolios – whether these are for mortgage or unsecured housing finance. Many governments have set their Treasury Bill rates high, to attract investor capital to fund their own plans. This ‘risk free’ rate sets the baseline for any other investments that an investor may make. As the perception of risk increases, investors seek higher returns and this translates into the high interest rates that prevail – very many above 10 percent – across Africa. The World Bank has been working in a number of countries to address this issue, with the introduction of mortgage liquidity facilities in Egypt, Tanzania, Nigeria and the WAEMU region. CAHF has developed a case study about these liquidity facilities. There are also housing supply-side issues. Without housing stock being created in the price range that the market can afford to buy at scale, there isn’t much argument for lenders to develop their housing finance products. Housing and finance are very closely interlinked – the performance of each is dependent on the performance of the other. Housing finance – investment capital, construction capital, end user finance, and all the facilitative interventions (guarantees, insurance, subsidies, etc.) that happen in between – is a critical ingredient to addressing the housing challenge in Africa. This section of the financial sector is underdeveloped for two reasons. First, financial sector development initiatives focus largely on other sectors: insurance, agriculture, small business development, and mobile money. The notion of a housing sector in the African context is still very new and the financial sector is unfamiliar with its dynamics. This is possibly because of the second reason: that housing finance is dependent on a much wider array of activities and sectors that together comprise the housing value chain – activities that are beyond the financial sector’s reach. Hites Ahir: What are some of the challenges for the housing sector? Kecia Rust: Challenges exist along the entire housing value chain, and each constraint in the system impacts on the availability of finance. 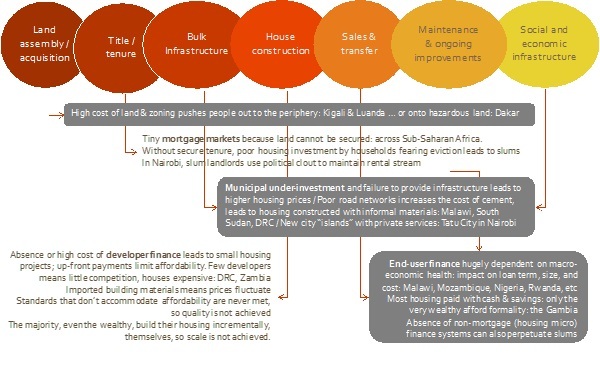 Improving the flow of finance for housing requires improvements along the value chain – some of which extend outside of the housing finance sector. A weak value chain discourages investors, so they seek other targets and relegate housing sector investment to government. Government, however, does not have the capacity invest in the nation’s housing process on its own – investor interest must be captured and maintained if the housing sector is to grow and develop and meet the needs of all residents. Hites Ahir: How can policymakers address these challenges? Kecia Rust: As a first step, policymakers must acknowledge that housing is a matter for attention across multiple sectors and multiple departments. This means that it is not only the housing and land department that must champion housing investment, but also the Central Bank and national treasury, as well as the National Deeds Registry. This is a matter for Cabinet attention. On the housing and land side, there is a critical need for focused interventions into land and titling, and into infrastructure to support residential development. Housing delivery at scale cannot happen without those ingredients, and their absence is a key reason why housing continues to be delivered mostly by households themselves. Much of housing delivery is influenced by what is happening at the local level, however – and it is here that municipalities can apply specific levers to influence market dynamics and stimulate supply. Zoning, subdivisions, building plan processes and approvals, as well as administrative incentives that ease the costs in both time and money of the housing delivery process, are all levers that municipalities can apply to stimulate investment in housing. On the finance side, macro-economic interventions to reduce the cost of capital and contain interest rates to reasonable levels for long-term finance are critically needed. Beyond that, policy makers should also consider the policy and regulatory issues that make mortgage lending possible and influence the cost of construction. In this regard, taxation appears to be a significant issue. Policy makers might wish to restrict taxes to upmarket housing for the wealthy, offering relief to the emerging middle class in the purchase of lower cost housing, or review how their current tax regime impacts on the attractiveness of this particular asset class. The Doing Business Indicators show us that in some countries, the cost of formally transferring property can be more than 10 percent of the value of the property. This becomes a serious disincentive to formal transactions. To understand all of this, a clear and targeted monitoring and evaluation system is required. City, provincial, and national governments should be collecting data on housing market performance and making this available in the public domain for analysis and engagement by investors and other stakeholders. CAHF believes that a key constraint is the lack of market intelligence – accurate and trended market information, a clear indication of risk and return, and track records that prove long-term viability – specifically targeting the opportunities and the challenges that relate to the affordable housing market. Without this information, practitioners move to familiar territory and high margin activities, while governments are left wondering why they don’t engage. Bringing together the efforts of the public and the private sectors towards workable interventions that target increased opportunities for housing that is affordable to all market segments, is a key aim of CAHF’s work. Hites Ahir: Are there any success stories that policymakers can learn from? Kecia Rust: On the government reporting side, there are some very interesting interventions underway. The central banks of both Kenya and Tanzania publish mortgage market updates that provide information on the development of their mortgage markets. And the Nigerian Mortgage Refinance Corporation is in the process of developing a Nigerian Housing Finance Hub, to collect data about Nigeria’s housing finance market and share this with market players. Some governments are improving their administrative regimes: Guinea Bissau has made significant improvements in the time it takes to transfer property, while Senegal has reduced the cost of registration significantly. Then there are very interesting investors that have made improvements with the force of their interest in making development happen: International Housing Solutions managed to stimulate the construction of over 27,000 houses for the working class in South Africa, through its first fund and is now seeking to replicate this experience in a second fund. Phatisa’s Pan African Housing Fund is active in developments in Zambia, Rwanda, and Kenya. IFC’s investment in the Chinese multinational construction and engineering company, CITIC Construction, is intended to set development precedents, targeting a scale delivery approach that is currently not very common across the continent. And there are more. Policy makers should actively engage with these efforts by the private sector to identify where they can smooth the value chain to enable more and better investment.